This is a book with an awesome cover and a great premise that in the end just didn't work for me. :( Which was a total disappointment, since I was really looking forward to reading it. Kalix is pretty much a feral werewolf girl with no friends and a family that she just doesn't get along with. Well, it's a little more involved and serious than that, because several of her family members are in constant pursuit of her, but not because they care. As she hides in the backstreets and abandoned warehouses of London, mostly starved, we get to find out a little more about her story. And the addictions that hound her. She's so desperate for the drug laudanum that she sells a pendant able to keep her whereabouts a secret. Anyway, the start of the story was pretty strong and interesting, but as new characters were introduced, I found myself getting lost and distracted away from the main story. When I'm thinking about other things while a book's in front of me, that's not good. So, I put it down several times, and even skipped ahead in some sections... No matter what, I just couldn't get into the swing of things. I'm not sure if it was the actual writing and head-hopping that did it, or if it was the scope of the story because this is a chunky book. 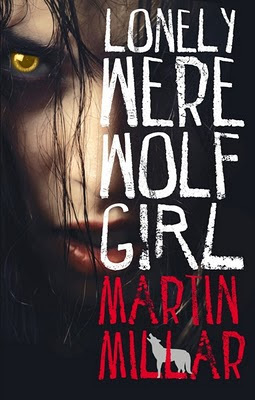 Lonely Werewolf Girl is a book with a lot of promise, but for me didn't deliver in a genre that I absolutely adore. It really saddens me to say this because I so wanted to love this book. But in the end, just couldn't.